My pedagogy has always been student-centered, participatory, and interactive. While I am excited about the possibilities of digital technology to enhance historical research and reach broader publics, I am also interested in the potential of digital media as a way to engage students. Currently, I teach at a private liberal arts university focused on undergraduate study. While I have long used in-class activities, group projects, and on-line discussion boards, last semester was the first time I considered social media as a method of classroom instruction and historical training. 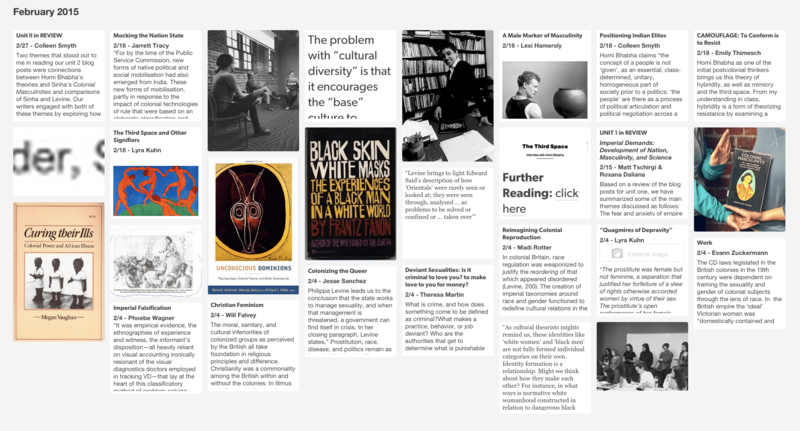 Tumblr, a microblogging platform and social networking website, was my first choice and I used it to build a collective digital archive with students in my history course Gender, Race & Empire. The course was comprised of an interdisciplinary group of about 20 undergraduates from all class levels. Students learned how to grapple with empire and its effects on sexuality across historical contexts. We studied sources from the age of Orientalism, which produced images like Le charmeur de serpents, through the legacy of racism today. Tumblr allowed students to post shorter, but more frequent reflections on readings and in-class discussions. Because the site compiled posts all in one place, students could read, build on, and revisit each others’ ideas any time over the course of the semester. To ensure a constant flow of fresh material, I designed a strict posting schedule. Combined with posting guidelines, the site laid a foundation for students to begin learning how to think and work collaboratively. I also chose Tumblr based on its archiving option and its search capabilities. Students could browse each other’s posts as smaller thumbnails, minimizing the need to scroll through dozens of pages. Additionally, the archive option allowed students to view posts as part of a collection rather than as single contributions. Tumblr also provided a convenient way to search and organize posts. By attaching hashtags (#) students could follow the work of specified classmates or view all posts focused on a specific text, offering an easy way to review discussion topics and track ideas over time. These elements were also useful as students prepared for essay assignments and the final exam. Students use Tumblr menu and hashtags (#) to search posts by topic and theme. The process of building a digital archive also strengthened in-class discussions about history as an academic discipline and the power of an archive to silence or privilege some voices. In this way the digital archive served multiple purposes. Engaging with it throughout the semester initiated lessons on methodology. My questioning about why certain ideas were missing from the archive, and what inspired students to post about particular issues over others, led to important conversations about the politics of knowledge and the challenges of documenting and interpreting experience. Tumblr’s interface allowed us to quickly identify patterns, but also gaps, in our thinking as a class. Creating the digital archive further contributed to the cohesiveness of our classroom community. It was more than just a place to upload responses or reaction papers. For one student, the archive disrupted traditional classroom discussion models or being forced to “think on the spot”—a practice that privileges those most likely to dominate classroom space. Another credited the archive with “leveling the playing field” and expressed her excitement as she connected with classmates who were less assertive by reading their posts online. This aspect of the archive did not replace classroom discussion, but enhanced it. One student reflected, “We seemed more comfortable offering up ideas and allowing others’ input … being more aware that it was an intellectual conversation meant to benefit everyone.” The medium itself became the method of creating a more inclusive learning experience. the public visibility of the blog absolutely influenced the content … [It] made me think about how I could convey theories labeled with academic names to the general public … If I had just written the paper to you, I could assume your knowledge … There’s also the important aspect of informing. I wrote those posts with the motivation of someone hopefully seeing the connections I did between [Philippa] Levine and [Nayan] Shah’s description of colonialism and recent events in Palm Springs. One of the biggest challenges was assessment. I chose not to grade individual posts. Instead, I offered each group collective comments in class. While extremely time consuming, many students found feedback in front of the whole class raised the stakes of the project and motivated them. While end-of-semester evaluations revealed that some students preferred individual grades, others explained that they felt more freedom to explore topics precisely because posts were not “formal graded assignments.” In the end, I factored student engagement with the archive in their participation grade and a final essay assignment. Students can browse posts as smaller thumbnails using Tumblr’s archive option. For instructors interested in teaching with Tumblr and creating their own collaborative course archive, planning and encouraging creativity are most important. A posting schedule and class time devoted to writing were key; both emphasized that the archive was central to the course and not simply a place to upload homework. Additionally, a digital archive uniquely provides students with a space to engage with non-written sources. The use of music, art, photographs, interviews, and video clips alongside writing is a testament to the possibilities of such a project to inspire critical thinking about the multiple forms of popular and visual culture students are inundated with on a daily basis. I envision that this project could be replicated in smaller upper-division undergraduate courses, honors courses, or graduate level seminars. As a teacher, the process of creating a collaborative digital archive enhanced my pedagogy. On a practical level, it aided my own class preparation. I used it to regularly evaluate why students were drawn to certain topics, what theories needed clarification, and what ideas proved most challenging. It also strengthened my ability to create an inclusive and collaborate classroom. Finally, by creating a public space for students to do intellectual work and connect readings and theories to their own lived experiences, the archive reinforced their role as knowledge-makers—students as producers, not consumers. A special thank you to Noor Amr, student site manager and digital humanist extraordinaire, and to my students Gabrielle Klein, Natasha Parekh, Madison Rotter, Jesse Sanchez, Emily Schlack, Colleen Smyth, Emily Thimesch, Matt Tschirgi, Angela Turpen, and Pheobe Wagner whose written reflections made this post possible. Comments by panelists and participants at the 2015 Northwest Five Consortium’s 729 Miles of Technology Conference were also useful. 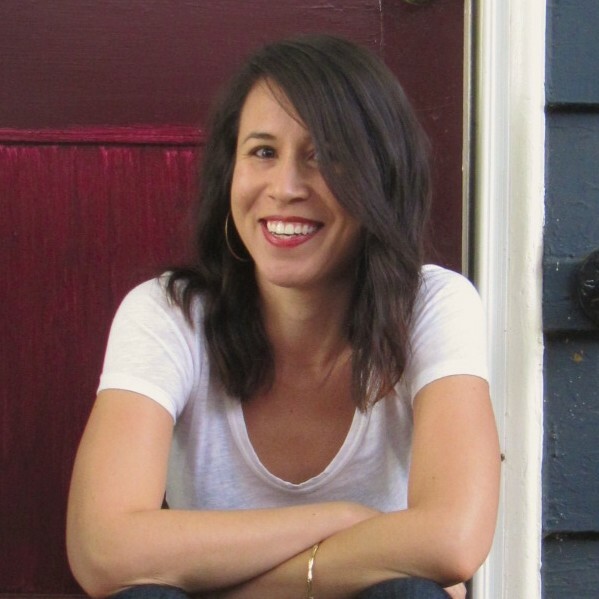 Bianca Murillo is an Assistant Professor of History at Willamette University in Salem, Oregon. Her research and teaching interests include modern African history, global capitalism, and critical race and gender studies. Her research has been published in Africa, Enterprise & Society, and Gender & History. Her book Conditional Sales: Global Commerce and the Making of an African Consumer Society is forthcoming with Ohio University Press as part of its New African Histories series.